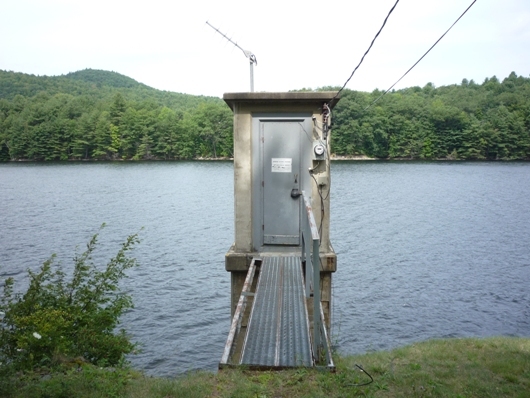 LOCATION.--Lat 43°18'57", long 73°55'39" referenced to North American Datum of 1927, Saratoga County, NY, Hydrologic Unit 02020002, 800 ft upstream from right end of Conklingville Dam on Sacandaga River at Conklingville. PERIOD OF RECORD.--January 1930 to current year. Prior to October 1969, published as "Sacandaga Reservoir at Conklingville". GAGE.--Water-stage recorder. Datum of gage is NGVD of 1929, adjustment of 1912. To convert elevations to NAVD of 1988, subtract 0.88 ft. Prior to Apr. 23, 1930, nonrecording gage at same datum in outlet channel 800 ft downstream. REMARKS.--Reservoir is formed by earth and concrete dam; storage began in March 1930; dam completed in 1930. Usable capacity for stream regulation, 29.920 bil ft³ between elevations 740.0 ft and 771.0 ft (spillway crest). Elevation of inverts of three Dow valves is 699.0 ft. Capacity of 7.800 bil ft³ below elevation 740.0 ft is considered dead storage, except for extraordinary emergencies or for necessary inspection of structures. Figures given herein represent total contents. Purpose of reservoir is to provide flood control and low-water stream regulation for sanitary improvement, navigation, and power, as required by the public welfare, including public health and safety. Area of water surface of reservoir filled to capacity, elevation 771.0 ft, is 41.7 mi². EXTREMES FOR PERIOD OF RECORD.--Maximum elevation, 774.47 ft, May 1, 2011, contents, 41.824 bil ft³; minimum elevation since first filling, 729.55 ft, Mar. 30, 1940, contents, 2.100 bil ft³.